Lubricant characteristics and performances are managed by standard or industrial organizations as API, ACEA, and SAE through specific norms. These technical requirements as physical properties, engine tests results and other various OEM’s criteria. Engine lubricants, which originally contained no additives, were first classified in 1911 on the basis of their viscosity, using the first viscosity classification of the American Society of Automobile Engineers (SAE). It has been changing ever since. The SAE grade determines oil's fluidity at high and low temperatures. Its purpose is to classify lubricating oils for engines and transmissions on the basis of their viscosity at a reference temperature. 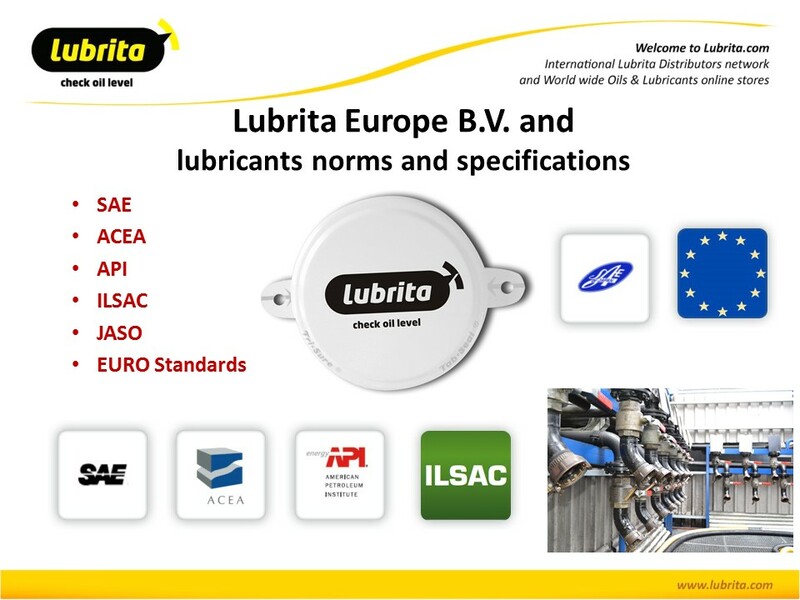 LUBRITA engine oil SAE grade of 5W-30 as example indicates viscosity index at low temperature (5) and at operating temperature (30) degrees. The European Automobile Manufacturers’ Association, the ACEA, has created a classification of lubricants according to their technical specifications and the requirements of each OEM engine type. Among the Association’s members are: Ford Europe, PSA Peugeot-Citroën, Daimler, BMW, Jaguar-Landrover, Renault Group, DAF Trucks, Fiat, GM Europe, MAN, Porsche, Scania, Volkswagen, Volvo and Toyota Europe. Tests are performed in order to classify lubricants into standardized categories, primarily using European engines and under European driving conditions. The standard is made up of a letter which represents the engine type and a number which represents its performance. The latest version of the ACEA dates from 2012 and is applicable as from December 2013. Four categories of common standards for gasoline (letter A) and diesel (letter B) engines. The American Petroleum Institute, the API, is the organization representing the petroleum and natural gas industry. It is made up of petroleum companies, gasoline additive firms, car manufacturers and testing laboratories. Its role is to create a classification according to the performance of lubricants. This classification is updated as soon as any new problems are highlighted by American car manufacturers. The standard uses two letters. The first represents the type of application (S is for Service qualifying for gasoline engines, C for Commercial qualifying diesel engines). The second gives the performance level of a lubricant, according to the year the standard comes into effect as this chronological timeline shows. The API considers all standards which precede SJ and CF as obsolete. The SN standard represents lubricants that give improved protection to engines. These lubricants improve general engine performance and allow extended oil change intervals. The CF standard concerns indirect injection engines. CF standard lubricants efficiently control deposits. Tests performed by ILSAC/OIL are certified by the API. • GF-1 and GF-2 are now obsolete. • GF-3, introduced in 2001 (API SL level+ improved Fuel Economy +improved volatility+deposit control and viscosity performance) with a limit for phosphorous of 0.1% max. GF-6A: backward compatible with GF-5, but with improved fuel economy and durability. GF-6B: similar performance as GF-6A, but allowing more fluid grades such as 0W-16. The Japanese Automotive Standards Organization or JASO, has established its own standards in terms of performance and quality for Japanese engines. DH-1 and DH-2 for industrial diesel engines. DL-1 for for Diesel passenger cars engines. Qualification of fuel economy lubricants. The Euro standards must be directly applied by the automotive manufacturers. Thanks to its environmental policy, LUBRITA lubricants is committed to developing oils allowing OEMs to meet these standards.